Retrieving user input from the display, Storing data in a database table. In this stage you will model some basic application logic - retrieving the requisition description entered by the user (through the popup form) and saving it in a database table. This stage’s modeling should be performed in the Tutorial 2-3 project, you imported at the end of the previous stage. In the previous stage we learned how to model a form for simple data entry. We mentioned that one crucial thing was missing – saving the data entered by the user. 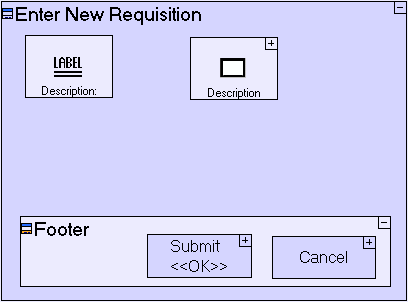 So now, let's model the saving of the requisition’s description when the user clicks the Submit button. As mentioned above, Tersus modeling employs a zoom-in technique in which application logic is defined "inside" the display element which invokes it. In our case, saving of the requisition’s details should be performed when the button is clicked, so it will be modeled inside the Submit button. Zoom into the Submit button by double-clicking on it in the model editor (or in the Outline view). Select the Data Types/Database Record template ( ) and drop it into the button. Name it Requisition. A data structure is a collection of data items (either “primitives” like a number or a date, or other data structures). Data structures appear in the model as gray rectangles. You may have noticed a Data Structure template appearing next to the Database Record template in the Palette. The two templates are practically identical, except for the fact that a Database Record structure is automatically associated with a matching database table, and since we would like the Requisition data to be stored in the database, as we will see later in this stage, we are basing it on a Database Record. Next we should define the fields comprising the data structure. To insert data elements into the data structure, we simply drag the appropriate data types (Number, Text, etc.). Select the Data Types/Number template ( ) and drop it into the Requisition data structure. Name it Id. Select the Data Types/Text template ( ) and drop it into Requisition as well. Name it Description. The Requisition data structure now contains 2 fields: Id, which is to be an automatically-generated unique identifier for each requisition, and Description, which is a free text description of the requisition as entered by the user. As explained previously, Id must be an automatically-generated, unique identifier. It must be unique, because we don’t want any two requisitions to have the same identifier. Select the Database/Sequence Number template ( ) and drop it into the Submit model. Name it Requisition Id. Sequence Number is an example of a built-in process (action) that generates a new unique identifier. A process is something that is being performed. A process can be a built-in action provided with the Tersus platform, and accessible through the palette (e.g. a basic mathematical calculation), or a more complex process modeled by a user (either you yourself or someone else). Process modeling is the major activity required for creating a solution (a solution is comprised of display models, data models and process models). When a process (in our case Sequence Number) generates some output (the unique identifier), the output needs to “exit” the process in order to be used by another process or populate a field of a data structure. An Exit slot is modeled as a gray triangle ( ) that appears on the frame of the process model. There are two major types of Slots: Triggers that receive data when a process starts (discussed later), and Exits that expose data generated by the process while executing. The Sequence Number template outputs the unique identifier it created through the predefined <Next> exit. Of course, we still need to pass this generated identifier from the <Next> exit of the Sequence Number process to the Id field of the Requisition data structure. To do this we shall use a Flow. Select the Flow tool ( ) at the top row of the palette, click on the <Next> exit slot ( ) of Requisition Id to specify the Source, and then click on the Id field in Requisition to specify the Target. An arrow should appear linking the slot with the field. While using the Flow tool, the mouse pointer changes to signify whether the current position can serve as the Source or Target of a flow definition. Order of Execution: When should each process be executed (and depending on what conditions). Data Flow: When and how are data items passed. Now that we've stored the automatically generated identifier in the Requisition data structure, we need to store the Description in the same data structure – after all, this is the real information we are interested in. To accomplish this we shall define a new type of element in the model called a Display Data Element. A Display Data Element is an alternative representation of a Display element (and its sub-elements) as a data structure. It's main purpose is to provide access to the contents of the display so that it can be read from or written to. For example, look at the display hierarchy of the popup we are modeling, which contains a label, a text area, a footer and 2 buttons (see screenshot of the Display - below left). This is represented by a data structure of the popup, which contains data structures for the text area, button and label; the text area contains another data structure for its value (see screenshot of the Display Data Element - below right). The order of display elements in the Display Data Element screen shot (above right) may be different from the one you see in your model. The order of appearance is defined by the order in which the elements were actually added. As long as all the elements appear (at any order) the runtime behavior will be consistent with the tutorial. 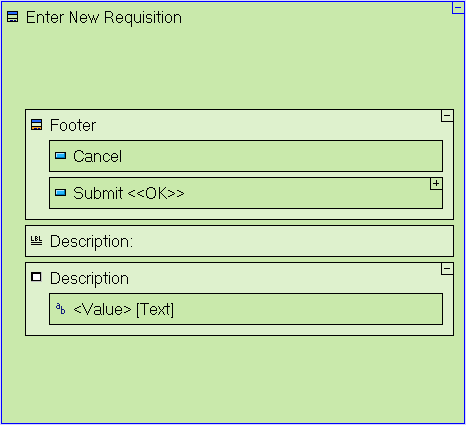 Right-click on the Submit button, select Add Ancestor Reference from the menu, and select Enter New Requisition. Notice that the inserted data structure has a blue frame (as opposed to the regular black frame of other elements). The blue frame indicates the fact that the data structure is a reference to another element (the Enter New Requisition popup), so that as data changes in one the change is automatically mirrored in the other. Use the Flow tool ( ) to link Enter New Requisition/Description/<Value> to Requisition/Description. Most display elements contain default data elements through which they can be manipulated. These data elements are identified with a descriptive name (such as Value) surrounded by angled brackets (<...>). The Requisition Id sub-process generates an identifier that is passed to the Id field of Requisition, and the content of the Description text area (entered by the user) is passed to the Description field of Requisition. Select the Database/Insert template ( ) and drop it next to the Requisition data model. The Insert template includes a <Record> trigger slot ( ) through which it receives the data structure to be saved in the database. Trigger slots are used as the entry point through which a process receives input data when its starts executing. Select the Flow tool ( ), then click on the Requisition data structure (anywhere outside the Id and Description fields) to define it as the source of the flow, and then click on the <Record> trigger of the Insert model to define it as the target of the flow. The meaning of the last change should be straight forward – the Requisition database record data structure is inserted as a new record to the database, into a database table with an identical name: Requisition. If the table does not exist in the database, it will be created automatically by the application server. Notice that many slot names in templates (such as Sequence and Insert in the above screenshot) use a specific naming convention, where the name is surrounded by angled brackets (‘<…>’). These are reserved names on which template functionality may rely. If a reserved name is changed, the template may fail or function incorrectly. Select the Display Actions/Close Window template ( ) and drop it into the Submit button. The Submit model has 2 parts occurring in an unspecified order, one is the Close Window process, and the other is the chain of processes which saves the requisition data in the database. Sometimes it is mandatory to specify which process occurs first, because the order of processes is an essential part of the application’s logic. In other cases the order in not important, but nevertheless, it is a good practice to make sure processes occur in a well defined order even when this is less critical. 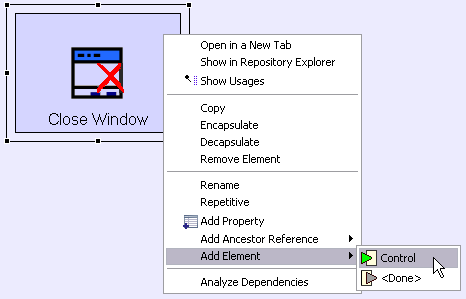 We want to make sure that the Enter New Requisition popup window closes only after data has been saved, therefore we should define a flow which specifies that the Close Window process occurs following the Insert process, and only if insertion was successful. Right-click on the Close Window element, open the Add Element sub-menu, and select the Control trigger element. The “hidden” Control trigger, is available due to the fact that the Close Window template is implemented as a Prototype. Prototypes define the elements making up a given model, and what parts of it are mandatory. In Close Window's case the trigger is not required in order for Close Window to function (as demonstrated by the Cancel button in our popup), but in most use cases (such as the one we have implemented here) the trigger is needed, and so it is provided as an optional element of the Close Window prototype. It should be noted that the other templates are also implemented as prototypes. For Example: Insert's prototype includes a “hidden” exit, <Duplicate>, which is useful in cases where the record to be inserted has a duplicate key, in our case, if the Requisition data structure contains an Id which already exists in the database. But as this will never occur in our model (we are generating a unique Id using the Sequence Number template), the <Duplicate> exit may remain “hidden”. It is important to point out that all elements available through the Add Element sub-menu are there for 'shortcut' purposes only. Each element can actually be created manually (in the specific case that is by dragging a trigger from the palette onto Close Window, and naming it Control), and will work just as well. Select the Flow tool to link the <Inserted> exit of Insert to the Control trigger of Close Window. You may have noticed that the Insert/<Inserted> trigger in the preceding screenshot has been moved from its default position. This has been done to make the model more “readable” to the modeler, and has no effect on the model’s functionality. Click the Launch the application toolbar button. At this stage we still cannot see the content of the database to verify the requisitions have been successfully stored in it. We will model this later. If you wish, you may use an external tool (usually provided by the DBMS vendor) to verify that the Requisition table has been created in the database and to view its content. Import the sample project Tutorial 3-4 and use it as the basis for the next stage of the tutorial. We have completed the modeling of the logic performed behind the scenes, retrieving user input and saving it in the database. You may now proceed to Stage 4, in which we will implement a table display of all the requisitions stored in the Requisitions table.